Residents give their positive responses regarding pelican crossing as pedestrian crossing bridge (JPO) replacement in Bundaran HI, Jl. MH Thamrin, Central Jakarta.
" Selamat Datang Monument is more visible and sidewalk is better"
An employee in one of shopping centers on Jl. 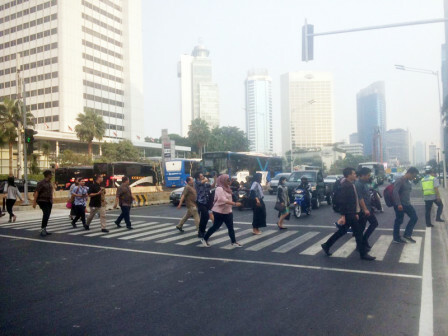 MH Thamrin, Rendi (30) expressed, pelican crossing is more helpful and effective than JPO. He said, he can cross the road without wasting much energy and faster using pelican crossing. "It is more effective and efficient. Moreover personnel are standby to help crossing the road. This pelican crossing is similar as in Singapore," he mentioned, Friday (8/3). Another positive response is conveyed by an office worker on Jl. MH Thamrin, Echa (28) who mentioned pelican crossing gives a plus point in terms of aesthetics. Not only a broader view, but pedestrians can also enjoy the results Jalan MH Thamrin arrangement. "I can see a broader view. Selamat Datang Monument is more visible and sidewalk is better. I think it must be added with more plants to support its aesthetics," she explained. Meanwhile, other resident, Tommi (25) added, pelican crossing can educate motorcyclists to be more orderly on traffic regulations and respects pedestrian's rights. "It also educates road users to be aware and obey the traffic regulations," he stated.